You'll find every Portland loft, condo, townhome and high-rise currently available for sale on this site with pictures, pricing and more. Search all Portland buildings and see what's available in each. Filter by neighborhood, building type and more. 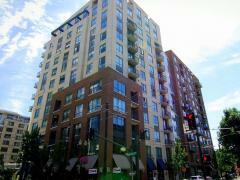 Highrises Realty of Portland is a team of high-rise specialists. Contact them for expert representation. With very few exceptions, Portland high-rise condo buildings are generally dog-friendly. What really separates the good ones though is the access to green space when it's time to take your four-legged kid for a walk. To help with that we've highlighted a few buildings here that are not only dog-friendly but in a great place for walks. Encore -Fields Park is right outside the front door, and the park has a large open green space as well as an off-leash dog park. The building also has townhouses with large patios that are excellent for dogs and their owners! The Elizabeth - This building is very dog friendly. Just one block away is the North Park Blocks where dog owners love to take their dogs for long walks on this stretch of green space spanning several city blocks. The Vaux - This 145 unit mid-rise condo welcomes owners and their dogs. And just one block west is Wallace Park with its off-leash dog area along with plenty of trails. The Civic - This high-rise is very dog-friendly, from the treat-giving concierge to the no-mess concrete floors throughout. Washington Park is nearby with hundreds of acres of hiking trails, gardens, parks, etc. Also nearby is Couch Park which offers an off-leash dog area. Want to live above it all, and enjoy the highest views in Portland from your living room? Then consider these buildings as they are the ten tallest Portland residential condo buildings currently available. Listing information last updated on April 24th, 2019 at 6:39pm PDT.